If you’re after some vintage Christmas postage stamps then I have a few Zazzle sets here that you should enjoy. These sets include matching Christmas cards, Christmas envelope labels and postage stamps. I am planning to bring you regular posts of Zazzle sets for you comprised of both my own designs and other peoples. 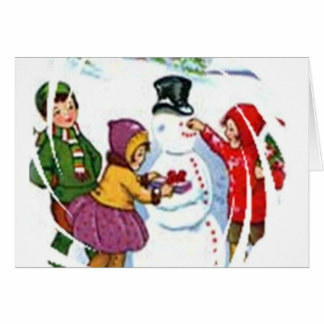 This vintage rosy cheeked child and his newly made snowman is a gorgeous image for a vintage Christmas card and to be able to carry the image over to matching address labels and a Christmas postage stamp is great. In case you can’t guess I really do like snowmen on my Christmas greeting cards!